US goes dry; National Fig Newton Day, combusting chicken manure, orca menopause, Cooper worked for Boeing? Today is Monday, January 16, the 16th day of 2017 in the Gregorian calendar, with 349 days remaining. 658 days until the 2018 midterm elections. 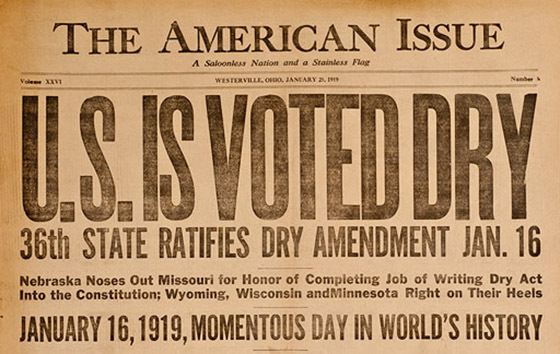 On this date in 1919, the Eighteenth Amendment to the U.S. Constitution was ratified, authorizing Prohibition in the United States, which became effective one year later. Prohibition ended with the ratification of the Twenty-first Amendment, which repealed the Eighteenth Amendment, on December 5, 1933. Among other things, today is also National Fig Newton Day. Newtons are a Nabisco trademarked version of the fig roll, a pastry filled with fig paste. Their distinctive shape is a characteristic that has been adopted by many competitors including generic fig bars sold in many markets. They are produced by an extrusion process. The product was named after the city of Newton, Massachusetts. Florida man robs bank, posts spoils on Instagram, gets caught. As of this writing, The KGB Quotations Database contains 44,939 entries. Check it out. "Good and evil are not like the Redskins and the Cowboys." Headline of the week: Spontaneous combustion concerns lead to warnings over height of chicken manure piles. Turns out that animation is a universal language. Amazon seeks FCC approval to run mysterious wireless tests that could be related to drone delivery. Volkswagen is considering an all-electric, self-driving Microbus. And from Saturday Night Live's Weekend Update, Ford is considering re-introducing the Bronco in 2020- just in time for O.J. 's parole. Only three mammals experience menopause: humans, short-finned pilot whales, and orcas. Scientists think they've figured out why orcas do. It turns out being a grandmother is a good thing. D.B. Cooper could have been a Boeing employee or a contractor who wore a tie to work. Rare earth elements found by electron microscope analysis suggest the long-missing skyjacker may have worked on Boeing's aborted SST and could have been among the thousands of workers displaced when the government pulled the plug on the project. How to make Amazon's Alexa and Google Home talk to each other in an endless loop in four easy steps. Moon Express- the California-based company with hopes of mining the Moon someday- has received full funding for its first trip to the lunar surface, slated for later this year. The company just raised $20 million in its most recent round of financing, and has raised over $45 million in total so far. That money will go toward launching Moon Express’s MX-1E lander, which will explore and take pictures of the Moon’s surface after launching on an experimental Electron rocket. There was an ice storm of sorts at the box office this weekend, with three major releases skidding into the ditches. Martin Scorsese's Silence, Ben Affleck's Live by Night, and Monster Trucks are DOA. Elsewhere, Hidden Figures will easily win the Martin Luther King holiday weekend with $25 million-plus, while La La Land enjoys a big Golden Globes bump and Rogue One approaches $1 billion. Opera star Andrea Bocelli backs out of singing at Trump's inauguration after receiving death threats; social media comments prompt Jennifer Holliday to cancel; and it gets even worse.